6 Tips to Consider When Choosing Your Barcode Printer | Condor Solutions Ltd.
With the huge number of options on the market, you may feel overwhelmed when shopping for a barcode printer. Luckily, it’s easy to find the right model when you go through the steps to determine your needs. These tips will help you narrow down your choices and simplify the buying process. Barcode printers fall into four categories: desktop, industrial, mobile, and specialized. The best option for you will depend on average print volume, mobility requirements, and type of printing. Desktop – Desktop barcode printers are able to create around 100 to 500 labels per day making them ideal for offices and retail stores. Industrial – With a greater capacity than the desktop printer, industrial printers can produce around 1,500, 3,000, or even 5,000 labels per day, depending on the model. Some printers are also able to printer larger labels up to 8 inches wide. These barcode printers are useful for manufacturing and distribution centers as well as for large retailers. Mobile – Mobile printers offer a similar production amount to desktop printers but require no physical connection to a computer; however, print widths tend to be smaller at no more than 4 inches. Mobile printers are particularly useful for creating labels on the move. 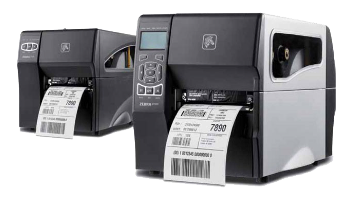 Specialized– Although standard printers are usually able to specialized labels, such as tickets, wristbands, and cards, if you only need a specific type of label, a specialized barcode printer is a more economical and efficient choice. Barcode printers are further divided by the printing method they use, either direct thermal or thermal transfer. Understanding the difference between the two is essential when making your choice of printer as it affects everything from the longevity of the label to the material on which you can print barcodes. Direct Thermal – In direct thermal printers, heat from the machine creates the image on the labels. These models have several advantages including their simplicity, their lack of a ribbon, and their ability to produce clear barcodes for easy scanning. However, as the barcode image is temporary, direct thermal printers are only suitable for labels that will be in use for no more than six months. Thermal Transfer – In these printers, heat transfers an image from the printer ribbon to a label. Barcodes can last for up to 20 years in average warehouse conditions and can withstand extreme temperatures. Thermal transfer printers can also create barcodes on various materials, including polypropylene and polyester, and print in a range of colors. As thermal transfer printers tend to be more expensive than direct thermal models, it is best to choose this option only if you need the additional printing capabilities. You also need to decide how you would like your barcode printer to communicate with your computer. All printers have USB connectivity but many also come with Ethernet or WiFi, which allows any machine in your network to connect to the printer. Print resolution is the number of dots per inch (dpi) the print head is able to produce. The higher the resolution, the crisper the quality of your barcodes. Before you complete your order, you should always consider what add-ons could be invaluable to printing barcodes in your business. Common features include cutters, rewinders, peelers, labels, ribbons, supplies, service agreements and the ability to create RFID-based labels. Finally, you should consider who you’re buying your barcode printer from. Authorized Barcode Resellers are always the best route. They have the expert knowledge, experience, great service, warranties and usually offer more than just barcode printers. For an example, Governor Business Solutions is a Zebra & Intermec Barcode Authorized Dealer that can provide you barcode printers, scanners, supplies and service all in one place. Authorized Dealers are great ways to protect your barcode printer investment and to obtain optimal support for your printing devices.